If you’re like most people, you usually start work with the intention of being as productive as possible. Yet, as the day rolls on you find yourself fielding multiple urgent requests and watching your task list grow. What you initially set out to accomplish always seems to get pushed to the side. If this sounds familiar, you’re not alone. Many of us don’t have a process for prioritizing tasks at work and always feel like we’re playing catch-up. We risk missing key deadlines and constantly worry about staying on track. But enough is enough. You can get ahead of the game with some simple methods to set priorities and manage your workload. You can’t decide how to prioritize tasks if you don’t have a single view of everything you need to get done in the first place. This may seem rudimentary, but it’s something that’s often skipped in the rush to dive into projects. Instead, take the time to list out what you need to work on across all of your projects. Be sure to break down bigger tasks into subtasks to feel less overwhelmed. Once your tasks are listed in one place, add additional information, such as the amount of time it’ll take to complete, level of importance, or urgency. With all of your tasks in one place, you’ll be able to see an overall view of what needs to get done, get a sense of how much work you’re dealing with, and what most likely needs your attention now. Don’t worry about organizing your tasks quite yet; just get them all in the same spot to start. Asana tip: My Tasks is a feature of Asana that automatically aggregates all the tasks assigned to you in a single view. It serves as the master checklist that keeps you focused on the right pieces of work. The Eat the Frog method is not a literal suggestion, but rather a system based on a quote from the ever-wise Mark Twain who said, “If it’s your job to eat a frog, it’s best to do it first thing in the morning.” In the world of work management, that translates to tackling big or complex tasks first. Those that serve the highest purpose and are tied to top-level objectives should be first on the priority list. Once you’ve eaten your frog for the day, you can slot in other tasks based on factors such as deadlines. Eat the Frog in action: Finish up that big presentation you’ll be making to the management team at the end of the week before you reply to emails, work on your review form, call clients, or iron out contract revisions. Another method based on a quote from a famous person, the Eisenhower Decision Matrix matrix method starts by organizing tasks into four quadrants, based on whether they are important, urgent, both, or neither. This approach helps you decide what to do now (important and urgent), what you need to plan for (important but not urgent), what you may be able to delegate (not important but urgent), and what can possibly delete (not important and not urgent). Eisenhower Decision Matrix in action: A colleague has just sent you an email asking for help with a sales presentation. This request is urgent because it has to be done today, but is it important enough (to you) to postpone other work? Measure each of the tasks on your own daily list for importance and urgency to decide whether you can shift tasks to help your colleague, or if it needs to be deferred to later. Knowing your commitments also helps you say no when you need to. With the ABCDE method, you take that task list you’ve created, assign each task a letter value according to its level of importance, and then tackle tasks accordingly. This is comparable to giving grades to your tasks, from A (very important), down to E (eliminate whenever possible). Make sure you’re always working on your A and B tasks first, because those are the ones that will make or break your success at work. ABCDE in action: You have eight working hours available today, but fifteen hours worth of tasks on your list. When you give each task a letter, though, only two qualify as A tasks, and most are D tasks that you can delegate or reschedule. Now you know to focus only on those A tasks, and leave the D tasks until later or pass off to another teammate. You’ve just gone from being overwhelmed to having a prioritized task list that focuses on the must-do items of the day. For the chunking method, a chunk is defined as a focused work activity. It can be self-contained (emptying your inbox), a slice of a larger project (completing the first draft of a document), or a collection of small, unrelated tasks. Your key here is to make these chunks focused, uninterrupted blocks of time. Turn off outside distractions and signal to others that you are unavailable. Taking breaks in between chunks is also important to relax and refresh. Chunking in action: You might start your day with one hour of design work followed by a coffee break. Then, two hours of scheduled meetings, lunch, and thirty minutes of email response time ends with one hour of research on a new client. You take a short social media break, head to the team update meeting and finish up with a final hour of design work. Asana tip: If you’re using Asana to manage your tasks, you can create custom fields to add additional information, such as a letter grade (if you’re using the ABCDE method), urgency and importance (if you’re using the Eisenhower Decision Matrix), priority level (if you’re going with Eat the Frog), or estimates on how long it will take to complete. Whether a task takes you minutes or weeks to complete, it always has a beginning and an end. So, once you have your list, add a start and end date to each task. Doing this will make sure nothing falls through the cracks as new things come up and priorities need to shift. If a task is assigned to you without clear start or end dates, be sure to ask for that information so you can schedule a time to work on it. Once you know these dates, you might even set your personal end date earlier than the actual deadline to account for unexpected issues or to turn in work early. Think of your work as a puzzle: You need to know the pieces will fit together, and start and end dates are the edges of those puzzle pieces. If tasks are puzzle pieces, with start and end dates noting their edges, then your calendar is the puzzle board where you assemble the bigger picture. Use it to schedule work, balance high-effort and high-priority tasks in a way that won’t overload you, and make sure you meet deadlines. If you’re adopting one of the prioritization methods above, use that framework to help fill your schedule. Asana tip: Using the calendar view in Asana, you’ll be able to spot days when you might be overloaded and also see open blocks of time. Take advantage of this view to shift tasks and spread your work out more evenly. Finally, don’t forget to loop in teammates who may be waiting on you to complete a task, or vying for some of your time. By proactively giving teammates updates on task progress, when you plan to complete it, or any delays or blockers that come up, you can cut down on the amount of update requests you receive. Instead of constantly responding to those requests, you can keep doing your work productively and efficiently. Asana tip: Asana’s task comments feature lets you share updates and ask follow-up questions directly on a task to keep communication connected with the actual work you’re doing. When you clearly prioritize your work, you can increase productivity, better manage your time, and feel confident that you’ll hit your deadlines—every time. 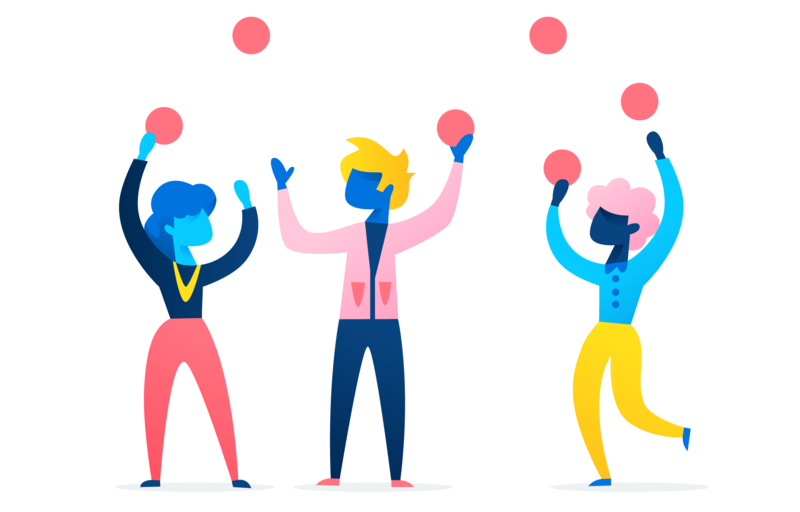 Boost your productivity even more by using a work management tool, like Asana, to organize and manage all of your tasks—no matter how big or small—in one place.